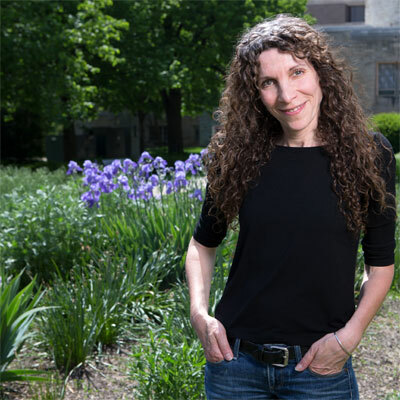 In the world of contemporary American poetry, NIU English Professor Amy Newman is a shining star. That might seem like a bold statement, but it’s easy to back up. Her numerous awards, five books and more than 250 poems, often published in top journals or magazines, speak volumes. Her feminist revision of Allen Ginsberg’s famous poem, “Howl,” was published last year in Poetry magazine, won a prestigious prize, was featured at a celebration in London and generated an impressive amount of media response. More recently, the New York Times published a glowing review of her latest book, “On This Day in Poetry History,” an innovative hybrid of poetry and biography. Newman brings incredible enthusiasm, innovation and passion to her art. And those same qualities burn brightly in her teaching. 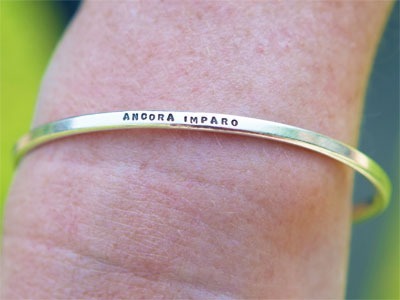 “I wear this bracelet to every class I teach as a reminder that I am still learning daily from my students,” says Newman, who was named an NIU Board of Trustees Professor this spring. The top NIU honor recognizes faculty for extraordinary scholarship and teaching. In her classroom, Newman creates an environment that fosters creativity, sparks student excitement in literature and nurtures a life-long love of language. During her two decades at NIU, Newman has taught 20 different courses at the graduate and undergraduate levels. She revises classroom materials yearly to introduce new texts, theories and techniques. And when she sees a need, she fills it. That was the case recently when she developed and taught courses on the history, narrative, rhetoric and reading of the graphic novel. She also designed, with professor Joe Bonomo, the English department’s creative writing certificate. Ultimately, the real measure of Newman’s success is her students. And they have flourished – publishing books, winning national awards, placing their work in scholarly journals and gaining entry into prestigious graduate programs and writers workshops. They go on to careers in teaching, business, nonprofits, media, music and the arts, with Newman often continuing to serve as a mentor and consultant.